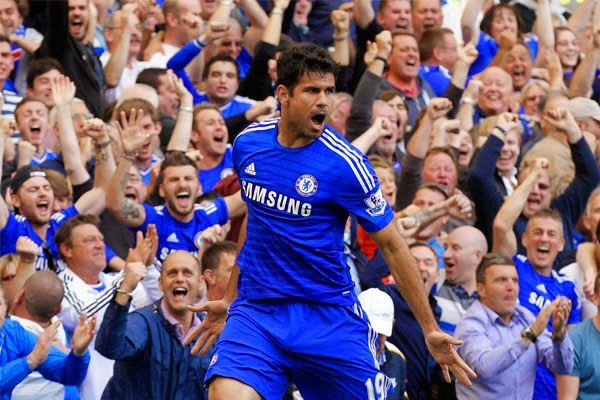 Can Chelsea’s strikers challenge for the Golden Boot? Nobody, not even manager Jose Mourinho can accuse Chelsea of being a team without a striker in 2014-15 as the club looks to address the issues that hampered the title challenge last season. After two games, new signing Diego Costa has scored twice to take the team to second place in an admittedly early table but already the Spaniard looks to have completed the squad and given us a more tangible threat in the campaign that lies ahead. Chelsea are among the favourites with Matchbook to win their fourth Premiership title and the arrival of Diego Costa in the summer looks to have solved the main problem for the West London club. In 2013-14, manager Jose Mourinho constantly bemoaned the fact that his team were desperately in need of a striker and the Spanish international has begun his Chelsea career in an extremely positive way. The Spaniard has looked sharp in both of his opening games against Burnley and Leicester City and while those newly promoted teams are expected to struggle at the back for the remainder of this campaign, a promising start together with a strong pre-season suggest that Chelsea’s main striker has a tangible claim on the Golden Boot trophy. With Samuel Eto’o and Demba Ba having been released at the end of the previous season, it was clear that the club would need extra personnel to back up Diego Costa so the return of Didier Drogba was a welcome one for so many reasons. An eight year career at Stamford Bridge yielded exactly 100 league goals in a spell which ended when the Ivorian headed to China in 2012. The 36 year old is now back in West London and although he has been restricted so far to just two substitute appearances, the striker is set for an important role in Chelsea’s current campaign. Drogba may have only experienced a few minutes on the pitch so far but that’s more than Fernando Torres who was an unused substitute against Burnley before becoming a notable absentee from the squad to face Leicester. The Spanish international may yet turn his Chelsea career around but 20 goals in 110 league games suggests that it may be no surprise if the 30 year old is offloaded before the summer transfer window draws to a close. In 2013-14, Yaya Toure laid a claim to the Golden Boot trophy for much of the season so don’t rule out Chelsea’s midfield who have started the new campaign in promising fashion. Eden Hazard’s 77th minute strike sealed the victory over Leicester while German international Andre Schurrle was on the mark in the opening win against Burnley. Hazard found the net 17 times in all competitions last season while Schurrle’s nine included a hat trick against Fulham. Both would need to improve in order to threaten the leading goal scorer charts but they shouldn’t necessarily be discounted. Overall however, Diego Costa is Chelsea’s main threat to the Golden Boot trophy and a great start to his Chelsea career makes him an early favourite amongst many pundits to take the award.